Looking for something to read this summer? The CJN has complied a list of books and reviews written by various Jewish authors. Every author and / or story is in some way connected to the Cleveland area. Children are notorious for asking, “Why?” in every situation. 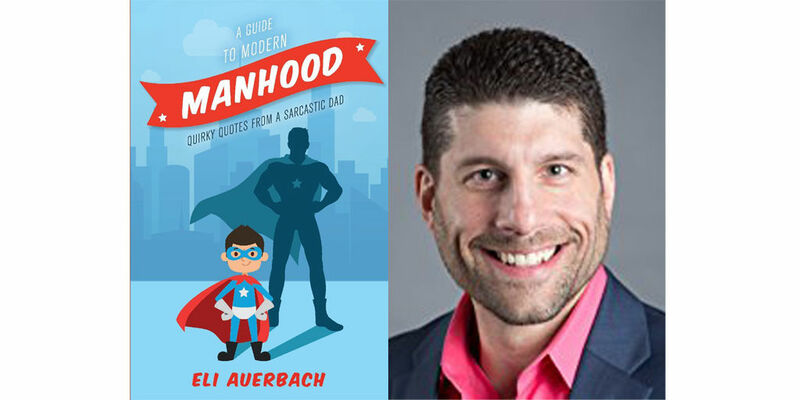 While parents usually say “because I said so” or “that’s just how it is,” Eli Auerbach pointed his son to the “Daddy Book” which holds all the knowledge a father needs to be a great dad. Although a leather-bound Jewish prayer book posed as the fictional omnipotent guide for years, his son eventually learned to read, discovering his father’s deception. Thinking that such a book really should exist, Auerbach decided to compile meaningful life advice for those entering manhood to follow, but most of the advice can be applied to anyone. Readers will smile at the book’s witticisms and quirky quotes. From the solemn “sometimes a hug is all that needs to be said” to the silly “don’t go grocery shopping when you’re hungry, unless you intended to bake 12 dozen cookies,” Auerbach imparts keen advice. Auerbach lives in South Euclid. The past 50 years of Cleveland’s LGBTQ community holds brave battles for equal rights, fighting sexism, racism, homophobia and transphobia, effects of the HIV/AIDS epidemic, an adversarial state senator and epic crowd scenes. That’s exactly what Ken Schneck portrays in his intentionally intersectional book filled with vibrant, action-packed photos. Several images were donated by award-winning photographers of celebrities making appearances in Cleveland, Freddie Mercury, Joan Jett and Billie Jean King. “The images on the pages throughout this book tell the tale of a more united Cleveland, a city that repeatedly came together as individuals, groups, and organizations to respond to conflict, fight for equality, and celebrate their identity,” wrote Schneck in the introduction. Schneck, an associate professor at Baldwin Wallace University in Berea, does a beautiful job of sharing stories that are distinct to Cleveland, but still expose what the LGBTQ community has experienced on a national level. This can provide readers a mixed feeling of pride in their city and a resonating feeling of societal issues. “This book is all about the pause: providing the reader an opportunity to stop for a second and appreciate the history that has come before us even as we let that past struggles and celebrations inform our current work,” Schneck said of the lasting impact he hopes this book leaves. 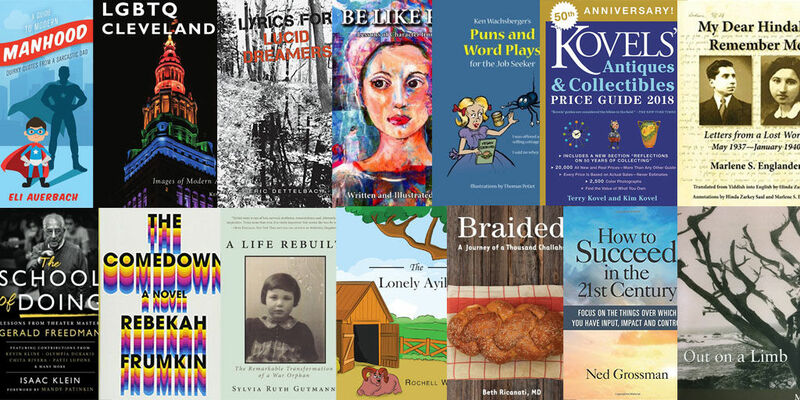 Eric Dettelbach’s collection of poems, “Lyrics for Lucid Dreamers,” evokes musical and rhythmic hints in its raw emotional content. A compilation of journal experts, loose leaf pages, backs of flyers and paper towels on which this collection was originally written, Dettelbach’s “Lyrics for Lucid Dreamers” explores raw emotion through rhymed and rhythmic phrases. Accompanied by haunting black and white photos, “Lyrics for Lucid Dreamers” becomes an immersive reading experience. Dettelbach, a resident of Lakewood, studied writing and poetry at Ohio University and is active in Cleveland’s music scene, heralding the original fusion wave of live instrumentation with hip-hop. For young girls, it can be difficult to find role models when some people of prominence demonstrate a lack of character. Carolyn Frankel, an author and artist from Chagrin Falls and member of Park Synagogue, considers her debut book, “Be Like Rachel,” to offer an inventive perspective on the qualities young girls should admire and strive to attain. The coffee table art book features 12 paintings of matriarchs from the Bible along with their stories, questions for personal reflection and instructions to integrate their traits into daily life. Cognizant of an increasing presence of deep-rooted divides in society, she thinks it is important to shine a light on role models that will teach us how to build a more peaceful, respectful world. “If character is our destiny, as I truly believe it is, why are we not more direct in teaching it?” Frankel said. The book beams with opportunity for insight and personal growth, containing lessons that can transcend beyond young women to incite a broader demographic to develop themselves as individuals with morals and integrity. These lessons include Hagar’s determination, Deborah’s leadership and Ruth’s loyalty. This book represents a shift for Wachsberger, who is a member of Temple Beth Emeth in Ann Arbor, Michi. He has written two Holocaust memoirs, a four-volume series on censorship and a four-volume history of the Vietnam-era underground press. Even with pockets less full than museum curators, the casual collector should be able to educate themselves on how to pocket a steal from flea markets or shops. The Kovels, exalted by some as the top authorities on collectibles in this country, have published a new price guide to help. With nonpareil catalogs spanning through 1968, this compilation of updated valuations celebrates the annual publication’s 50th anniversary. The guide contains 20,000 prices based on actual sales and 2,500 pictures with tips about antique usage, auction behavior and how to detect counterfeit. “We check prices; visit shops, shows, and flea markets; read hundreds of publications and catalogs; check Internet sales, auctions, and other online services; and decide which antiques and collectibles are of most interest to collectors in the United States,” wrote Terry Kovel, a Shaker Heights resident. When pen hits paper, it sparks a magic of emotion, passion and the opportunity for interpersonal connection. This is manifested in “My Dear Hindalla,” in which author Marlene S. Englander, a Shaker Heights native, captures the blossoming of two souls through the real-life handwritten jottings of Nochum Berman, a young adult from Šeduva, Lithuania, to his American immigrant teenage inamorata Hindalla “Hinda” Zarkey. The letters were written from 1937 through 1940 as the German regime accrued strength. Amid the harrowing global climate experienced by Zarkey and Berman, the pair endeavors to rewrite the stars, determined to stay connected and bring Berman to the United States once Englander turns 21. As conditions worsen, Berman’s letters become reticent and infrequent until they stop altogether. Through historical books, reference materials and trips to Lithuania, Englander, a Shaker Heights resident and Zarkey’s daughter, has unearthed the many loose ends of both families’ histories to fashion this vivid anthology that gives insight into pre-Holocaust life. Ever wondered how to break into the world of acting – and even a leg? In “The School of Doing: Lessons from Theatre Master Gerald Freedman,” Queens-based writer and director Isaac Klein calls back the eclectic teachings of Freedman, an Obie award winner, educator and director to teach theater hopefuls how to snag a callback. Using testaments from past students, colleagues and friends, Klein portrays Freedman’s theater craft from pedagogy to comedy technique. “Over the course of 4 1/2 years, I spent countless hours poring over mountains of old notebooks, articles, speeches, transcripts, videos and audio recordings of Gerald in action in the classroom and rehearsal hall,” Klein wrote. Half of the profits from the book benefit the Gerald Freedman Excellence Endowed Fund, which assists students with financial need at University of North Carolina’s School of Drama, where Freedman was emeritus dean for 21 years. The suicide of a man caught up in a bad drug deal begins Rebekah Frumkin’s twisted novel that spans across America and four decades. The narrative connects the lives of 13 uniquely complicated characters from Cleveland and Shaker Heights to Chicago to the Florida Everglades. Readers will be completely engrossed in the works of Frumkin who stands out as an exceptional writer to watch. The characters have difference in race, class and religion but all share striking common bonds of family dysfunction, recreational and addictive drug use and ties to Leland Bloom-Mittwoch Sr., a conflicted Jew, casual bigamist and chronic whiner. The Comedown explores topics including the power of love and the existence of God, from why people appear to be born to make others suffer to the whereabouts of a yellow suitcase containing blood money, originally tying to Mittwoch. As the lives of these characters play out, social issues of poverty, mental illness, obesity, sexual orientation, gender fluidity and religious intolerance also play out. This is Frumkin’s first novel. As learning the history of the Holocaust remains relevant all over the world, reading a memoir can put parts of it into perspective. Take Sylvia Ruth Gutmann’s story – a Holocaust memoir taking a different approach than most by focusing on her life after the war and her recovery from personal trauma, with some settings in Cleveland. Gutmann was 3 years old when her family was murdered and emigrated to the United States at age 7, traumatized by her experience. She moved in with her uncle and aunt who was cruel by insisting she move on from the events of the Holocaust. Due to this environment, she lost almost all memory of her life before the U.S., except for the vision of her mother boarding a train leaving her behind. Gutmann has battled depression, weight gain and other symptoms now recognized as post-traumatic stress disorder. She also writes of her other candid travails, such as her dramatic marriages, financial struggles and raising a child who required special private education. “I wrote my book as my gift to anyone who has felt invisible and alone as I once did. By sharing what I have overcome in order to live as vibrantly as I do today, I want to let people know that anything is possible at any stage of life, at any age,” Gutmann said. The classic story of finding your purpose is a pertinent lesson for any child to read about. “The Lonely Ayil” is about a ram wishing to do something other than sitting and running around all day everyday – something important. He finally gets that chance when the farmer accidentally keeps the gate unlocked and Ayil escapes to find his purpose for his existence. He ends up doing a good deed for the Jewish community on the other side of the mountain and both he and the community are proud of his assistance for the Jewish new year. The author, Rochell Weisfogel, is a alumna of Columbus Torah Academy in Columbus, where she taught kindergarten Judaic studies. She is also the mother of the first Columbus quadruplets. Weisfogel originally told this story to her classroom and illustrated on the chalkboard every year before the Jewish new year, and it became a favorite amongst her students as she dreamed of getting it published for children everywhere to enjoy. Dr. Beth Ricanati discovered that sometimes baking is the best medicine after she began baking challah in her home. “Braided,” Ricanati’s literal and metaphorical recipe book, details not only the process of baking challah but also the healing process baking brings to broken hearts and busy minds. Part recipe book, part health guide, “Braided” kneads soulful lessons into every page, reminding readers to slow down and be present amidst their hectic day to day activities. Dr. Beth Ricanati received her undergraduate degree from the University of Pennsylvania in Philadelphia and her doctorate from Case Western Reserve University in Cleveland. She completed her internal medicine residency at Columbia Presbyterian in New York City. Ned Grossman’s thoughtfully constructed novel encourages readers to take a deep breath and make small changes in attitude that will set the framework for success. The Beachwood resident claims to be a fake author and just a dad with some advice he hopes to impart. Nonetheless, his words convey powerful messages like “years wrinkle the skin, but giving up enthusiasm wrinkles the soul,” which demonstrate shrewdness in wisdom and in prose. While the book teems with what might appear to be an overload of adages, maxims and suggestions, each person should look through the book and take only the guidance that they need to better themselves. Beachwood resident Marlit Polsky synthesized fragments of her journey through love, life and family to write her newest novel, “Out on a Limb.” She published the autobiographical novel to express her unmasked life as she sees it in her advanced age. The novel chronicles Polsky’s journey navigating life’s slippery streets, much like Cleveland’s icy winter roads. Hailing from a German family, she chose to include family photos that demonstrate her physical progression throughout the years that coincide with stories from pregnancy to senior classes. Dedicated readers, who Polsky said pressed for a continuation of her previous novels “Rouge Hags” and “America at Last,” can continue to embrace her candid, witty voice in this gripping tale of heartbreak, comical escapades and reflection. Compiled by Marissa Nichol, the Irving I Stone Editorial Intern, Tess Kazdin, the Violet Spevack Editorial Intern and Jacob Cramer, the former Yoda Newton Editorial Intern at the Cleveland Jewish News.